It’s all at the shopper’s fingertips today: a million stores, every kind of product, endless choices! It was supposed to be a good thing, right? Undeniably so. However, an unsettling trend is on the rise now. Almost 70 percent of carts are being abandoned, conversions are plummeting and ultimately, your sales are being affected. And it’s all happening because customers can’t decide what to choose. It’s called choice overload and yes, it’s hurting your business. Too many products to choose from often leave shoppers confused and exhausted. Not all of them are sure of what they want. Even those who know what they want, aren’t sure which product will give them exactly that. If there was a way you could reach out to them and offer help, ask what they are looking for and help them find just the right product, you’d not only increase sales but also make sure more customers leave your store satisfied and come back for more. The good news is – there is a way. A basic product search now reveals a mirror maze of options to a customer. There are what seem like a thousand types of smartphones that all look the same. Same goes for cameras, coffee tables, baseball bats, clothing, sunglasses, you name it. Heck, there are even at least a hundred different types of marinara sauce. Choosing one out of these is a task for the gods. Your store has filters to help customers narrow down the list of products, yes indeed. But filtering by features and specification is less than adequate as it doesn’t quite solve the customers’ problems, if they don’t know what they want. For instance, a customer may not always know that she wants a DSLR camera with ISO 600­-12800 or a 9-­point AF system and AI servo. Fancy terms like intelligent scene mode and RGB metering sensor might not even make sense to an average buyer. An fps-­5 or fps­-6? Phase detection or contrast detection? Wait now, she’s confused. Presenting products sorted by technical specifications does little but to confound the shopper. On the other hand, the shopper probably knows really well if she wants the camera to take pictures of her kids and family or shoot lakes and sunsets and hills. She is probably more interested in macro photography than HD video recording. A seasoned camera salesman would ask her questions about how she wants to use her camera and would match those requirements to the right specs, not the other way round. That is exactly what Guided Selling does. Digital product advisors ask the right questions to find out more about the shopper’s needs and recommend the right products based on the explicit and implicit needs of users. It’s how you create a fluid shopping and choosing experience. Not only do your customers leave your store happy because the whole process was quicker and smoother, but this approach also greatly minimizes returns. You are able to ensure the customer’s needs are fully met, so it’s less likely they experience buyer’s remorse or end up wanting a different product. 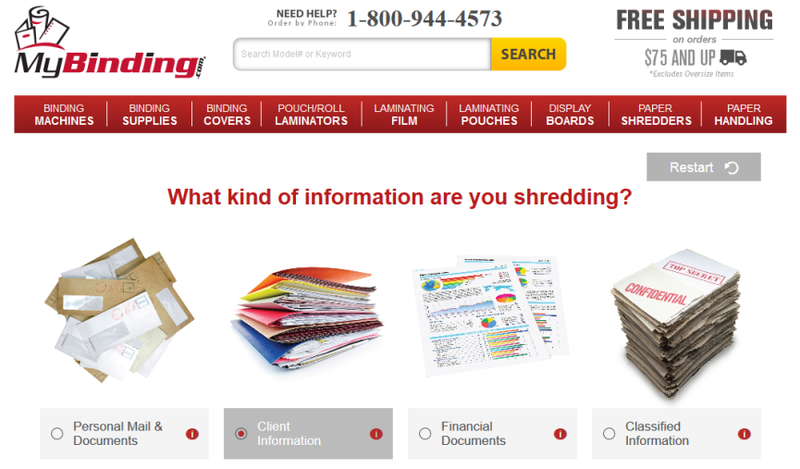 Mybinding.com, online store for binding and laminating supplies and equipment, runs on Magento and does a great job at advising and guiding overwhelmed or indecisive shoppers. Instead of having shoppers decide between Level 4 Micro cut or a Level 5 Particle cut shredder, they can answer a few simple questions such as the kind of documents they want to shred, the number of people who would use the shredder or how much do they wanted to spend. This is all it takes to match them up with a curated list of most suitable shredders and helping the customer decide within minutes. Mybinding.com used Zuvoo’s Guided Selling platform to create and design a questionnaire that blends in with their store seamlessly. Check out many more Guided selling examples here. There are two ways to do this. You can either create a custom­-built Guided Selling solution, or leverage a standard technology platform. There are some pros and cons to consider. You could choose to code interactive product advisors. This way, you have unlimited control over how you want your advisor to look and work. It can get a bit tedious though, especially if you are a busy entrepreneur running a successful business and don’t have time for the technical nitty­-gritty. Also, it’s not a one time job ­­ a tool like this is going to need maintenance and updates, so you might need to set aside a team just for that. Alternatively, you can use a standard Guided Selling technology that comes with all required features out­-of­-the-­box. It allows you to get started right away. You can use the interface to upload the product information, create questions, answers and the business rules, and design the advisor according to your liking. Most Guided Selling platforms, such as SMARTASSISTANT or the freemium version, Zuvoo, require little to no coding. In addition these SaaS solutions provide additional features and functionalities such as analytics, translation, and quick updates without touching code. The world of eCommerce is changing in unprecedented ways. While for a long time, best deals and bargains were quite effective at drawing customers, those gimmicks aren’t quite cutting it at keeping those customers now. A Customers 2020 study shows that by the year 2020, customer experience will be a bigger differentiator than price and product. Shoppers seek delightful experiences that simplify shopping. So it’s about time to stand out and rise above the competition by integrating better choosing experiences in your store. About the author: Markus Linder is an expert in the field of e-commerce and Guided Selling, in which he has been active since 2005. He is also the co-founder and Managing Director of Smart Information Systems. The technology company develops SMARTASSISTANT, a solution to quickly create and manage interactive Guided Selling solutions via an easy-to-use web platform.